Synopsis as taken from Goodreads.com: This world is trying to kill Lily Proctor. Her life-threatening allergies keep her from enjoying experiences that others in her hometown of Salem take for granted, which is why she is determined to enjoy her first high school party with her best friend and longtime crush, Tristan. But after a humiliating incident in front of half her graduating class, Lily wishes she could just disappear. What makes Lily weak at home is what makes her extraordinary in New Salem. In this confusing world, Lily is torn between responsibilities she can't hope to shoulder alone and a love she never expected. universes and dual POVs are becoming the new trend in YA novels, but this book shines above all the rest. Trial by Fire is written in the POVs of our protagonist Lily, her sister Juliet, and one of our bad guys, Gideon. I've never read a novel from the enemies perspective before and it was really interesting. It gave the book a wider scope for the happenings of the plot. This is not the type of book that you can quickly read, it's a slow, enveloping, experience that immerses you into a extremely well detailed fantastical world where witches reign supreme. 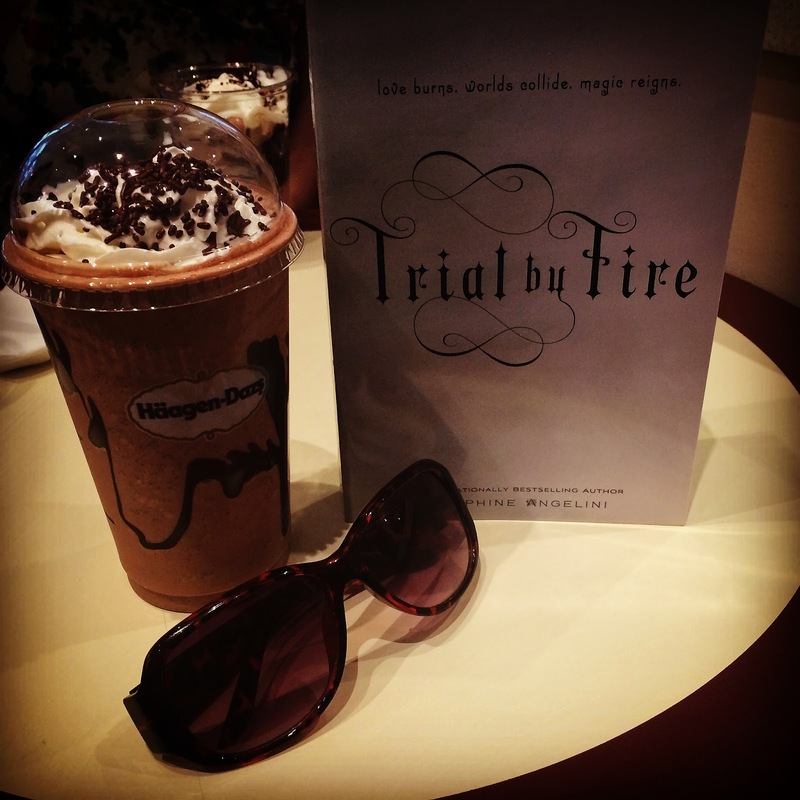 Trial by Fire is a new and exciting experience that I encourage everyone to check out! 1) Our female protagonist is one strong woman. I'm not just talking about her supernatural elements, but her values are ones that should be mirrored in our society. She doesn't allow herself to be walked all over by anyone, but she doesn't feel the need to tear them down, but simply not allow herself to be pulled back into emotionally-harmful situations. I was in awe how she did not go running back to the first boy that broke her heart and she didn't give him a free pass. No matter what she stayed true to herself. She allowed others to influence her but all in all she did what in her mind she believed was right and didn't bend to anyone's will. 2) All the details in this book were simply incredible. There wasn't much too much where I felt that I was overwhelmed but not too little where I didn't understand what was happening. The way the world of the book was written reminded me of how J.K. Rowling wrote the Harry Potter world except aspects of the modern world were still used in the magical world. 3) The struggle between Rowan and Lily is great. There was a real depth to their relationship and they did not just fall instantly for one another. Their spark wasn't instant, it had to grow, it was awkward, but really beautiful. 4) Even though I didn't find his character to be interesting, I thought it was really cool how one of the main POVs was from the enemy. The closest I have seen to this is in Lauren Oliver's Requiem, but it could be argued that Hana wasn't the bad guy. In this case, Gideon is the bad guy through and through, and the reader gets real insight to his mind, his plots, and it's really interesting. 5) Angelini created a new kind of intimacy between her characters when it came to their magical involvement. There wasn't need for the classic illustrations of affection, instead she connected her characters emotionally through their souls. Through their memories, the way they shared their feelings for one another is extremely unique to me. 1) I didn't really like Juliet's POV. It made sense to use her, to be able different between the protagonist and her parallel counterpart but they were so short and boring in comparison that I wanted to skip past them. 2) The main thing that confused me was Lillian, although her reasonings are explained at the very end of the book, to me it's not enough to make sense of all of her heinous actions. Or how she became so ill.
3) I wasn't very interested in the secondary characters in the book, I understood their function but I didn't buy into their little plot lines. The bond between Lily and her claimed men is cute but I'm not especially attached to them with the exception of Rowan. 1) She'd never seen a dead body before. He was so still, and he looked smaller, barely the size of a child. Lily heard herself hiccup and realized that she was crying. "Shh," Rowan breathed. He squeezed her shoulders and tilted his face towards hers. "Look at me." 2) Lily's first break-up I think is groundbreaking (at least for our current younger generation). I don't want to write it here and spoil it for everyone but it made me want to be a stronger person, and I think it sends an important message to all people. This same theme is repeated again with Rowan's exchange with Nina. It's so empowering and and awesome. 3) "Lily sat up and saw a glass of water on the bedside table. A tiny card was propped up against it. It said, Thirsty? in bold uppercase letters. Lily realized that she'd never seen Rowan's handwriting before. She started at it, sipping her water, memorizing every swoop and cruve. 4) "Is she here?" Gideon looked over Rowan's shoulder and saw two sets of dirty dishes on the table . "Apparently, she is. I'm surprised. It's not like you to leave a mess." "We had better things to do than the dishes." 5) Rowan turned and rushed back to the desk, opened the drawer and lifted his hand to take them. A whimper escaped Lily in anticipation of the agony to follow. Rowan's head turned, and he looked at her, his eyes narrowed. "He didn't touch--"Rowan saw the terrified look on Lily's face. "He did." Rowan took a steadying breath. "I won't hurt you." I hope you guys enjoyed this one!